I'm a big fan of kid-friendly art. Museums and exhibits that go out of their way to ensure that kids can experience culture right alongside their parents are some of my favorite attractions. For example, we visit 100 Acres at the Indianapolis Museum of Art every summer because the art is both interesting and family-friendly. 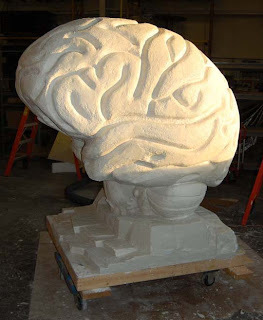 So when Matt Herndon, a freelance writer and father of three from Indianapolis, contacted me about writing a guest post previewing a new public art project in nearby Bloomington, Indiana called Brain Extravaganza, I was excited to share this new attraction with all of you. Matt explains why Brain Extravaganza is both fascinating and unique. The human anatomy has been the subject of countless works of art: from the astonishingly beautiful illustrations in Gray’s Anatomy to the morbidly fascinating exhibits from Body Worlds, we have used art as a way to better understand our bodies. But an art exhibit that’s both interesting and family-friendly can sometimes be hard to find. Brain scientist Jill Taylor is doing her part with the Brain Extravaganza, a collection of 22 giant fiberglass brains designed by a host of different artists and sponsors. Taylor, a neuroscientist whose study of the human brain included her own self-study after a devastating stroke, wants the exhibit to raise awareness about the role the brain plays in the body, as well as how powerful the organ is. The exhibit will debut in April of this year, and the decorated brains will be placed on street corners all over Bloomington, Indiana. For residents, visitors, and students who attend Indiana University, the brains will serve as works of art that encourage viewers to see their brains in new ways. So, how can a parent use the Brain Extravaganza to teach their kids about the brain? And how can a bunch of giant brains be a major attraction? If I can find an activity that keeps my kids interested and gives them a chance to learn, I feel like I’ve hit a jackpot. And Bloomington is a great town for a short road trip: walking through the streets and examining each brain on a warm spring day could be fun for both kids and parents. The five-foot tall fiberglass brains will be decorated to represent a variety of functions and themes: illnesses like bipolar disorder, or themes like memory and communication. The idea is to inspire viewers to think of the brain in new ways, and to teach them about the millions of tasks the brain performs each day. The pieces are also designed to raise awareness of rare brain disorders and diseases—one of the exhibit’s sponsors, IU Health Proton Therapy, is one of less than ten facilities that provide proton therapy for patients suffering from specific brain cancers. While you might not have a common knowledge of brain cancers, or how the brain processes thought in fractions of a second, you could use the trip to discuss the science of the brain with your kids. Try to answer their questions—and, if you don’t know the answer, you could use the opportunity to do some research together to discover the answers. The Brain Extravaganza is designed to be one town-wide conversation piece—and getting kids interested in science is always a good thing. Bloomington is also home to plenty of other attractions—bookstores and cafés, parks and museums—so if you manage to see every piece of art in the Brain Extravaganza, you’ll have other activities to keep you busy throughout the day. Thanks Matt! I look forward to taking the Arrows on an art walk around Bloomington this summer and see how many brains we can spot. Brain Extravaganza disappears in October, so be sure to get there in the next 6 months or so. Photo courtesy of Dr. Jill Bolte Taylor. This is a guest post about an exhibit sponsored by IU Health Proton Therapy. I was not compensated for this post, I simply thought it sounded like something that might be of interest to my fellow Hoosier readers and their families. I love art projects like this! We've seen one in Austin with cows and one in Chicago with globes. Kids love them. I hope you enjoy!